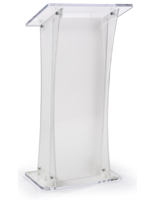 Did you know that acrylic podiums are a great way to make an impression during speeches, sermons, and business presentations? 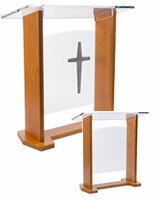 Our clear pulpits and plexiglass lecterns for sale feature modern designs that are very popular in today's market. 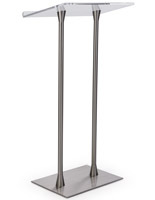 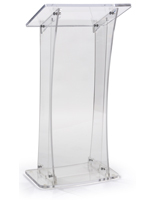 These acrylic podiums are masterfully bonded for durability and the plexiglass and plastic expertly cut during the manufacturing process to maintain clarity. 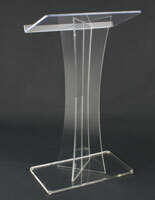 These crystal clear transparent Lucite and Perspex lecterns give a contemporary look to any environment. 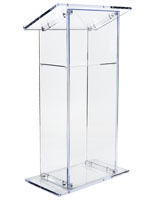 Our acrylic podiums for sale, also known as plexiglass pulpits, have crystal clear cut edges, rather than the clouded edging offered by many other manufacturers. 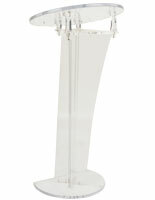 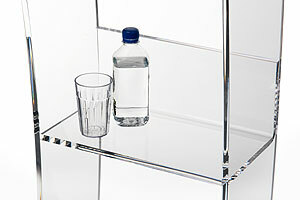 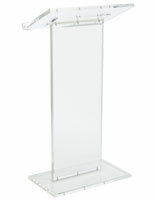 The result is a lightweight speaking stand that resembles glass, yet costs much less and is safer to use. 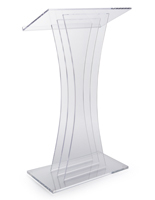 A modern, innovative atmosphere can be created in any location simply by adding one of these contemporary Lucite lecterns. 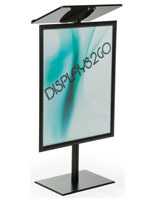 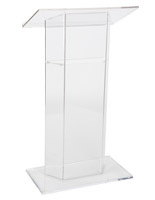 This type of transparent acrylic podium will complement any facility, including church, school, trade show booth, conference hall, auditorium, or boardroom locations. Where are plexiglass speaker's lecterns generally used? 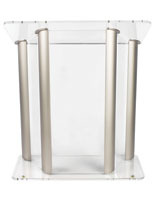 Acrylic podiums and pulpits are staples at many different religious facilities. 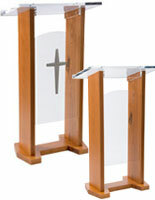 This type of contemporary church furniture helps clerical and religious leaders command attention during sermons, homilies, ceremonies, services and readings. 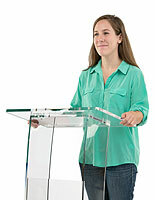 Schools often have an acrylic pulpit in their general auditorium as well as at the front of classrooms. 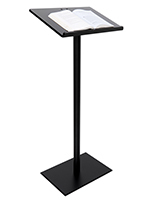 Teachers, guest lecturers, and students can give their oral reports and practice public speaking with the reading stands. 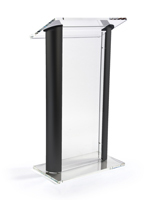 PTA and budget meetings as well as commencement addresses and team debates are all easily accomplished behind a crystal clear podium pulpit. 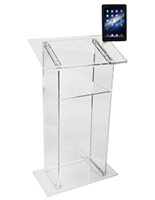 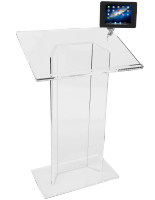 Conference centers and corporate offices use the modern look of Lucite podiums to give every speaker a professional edge. 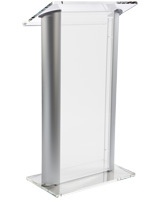 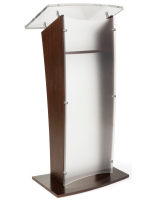 Sales presentations, annual reports, awards presentations, and boardroom meeting addresses can all benefit from the addded audience focus that a clear lectern adds to any facility. 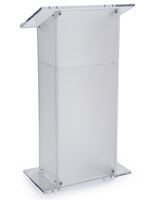 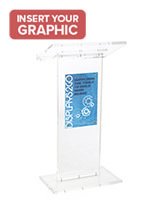 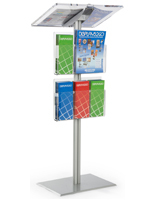 Lightweight plastic lecterns are ideal for use at trade shows and offsite events for a variety of reasons. 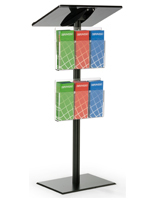 The simple construction makes these speaking stands easy to transport between locations, while the business-friendly designs are easily customized with printed logos, graphics, or messaging. 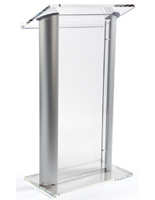 Plexiglass (sometimes spelled Plexiglas) styles that feature aluminum uprights are very appealing and elegant to any audience. 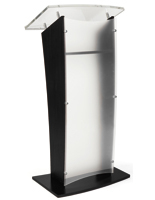 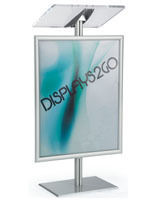 The versatile design has clear finish with upscale silver finish on the aluminum that looks great in any setting. 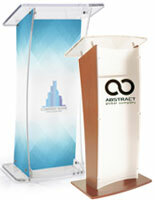 There are more elaborate wider stands that have several posts as well as units with just two or a single support. Consider the space you have at your venue as well as the purpose the podium will serve when making your selection. 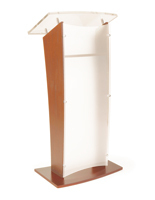 The high class feeling that these lecterns exude is sure to project professionalism. 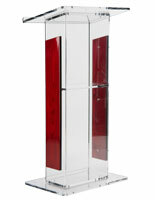 We also offer Perspex and Lucite podiums with wood veneer uprights. 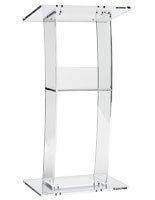 These are very similar to the silver aluminum versions but they introduce a more traditional feel. 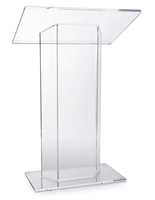 Many of our clear plastic lecterns, including pulpits with custom printed logos or church graphics, are designed with a large base for added stability. 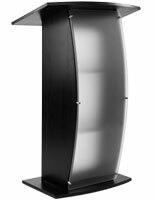 The slanted reading surface is another great feature because the angle ensures speakers are comfortable as they address their audiences. 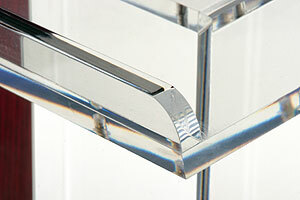 In fact, some of our podiums with clear construction allow for the top surface to be adjusted. 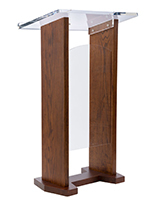 The ability to set a flat or angled surface is a benefit when the pulpit is used by more than one speaker, which is generally the case for shared facility furniture. 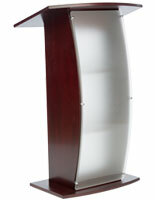 Other units feature built-in shelving that allows orators to place notes and reference materials during presentations. 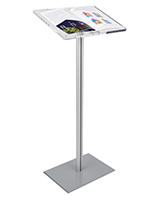 Some of our newest designs even feature tablet mounts that add to the already modern look. Our extensive collection includes a variety of styles and configurations, offers commercial high quality speaking furniture at wholesale cost. 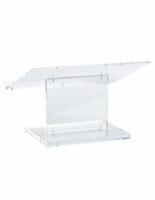 These clear plastic fixtures span the full range of sizes, finishes, and options, allowing businesses to easily find and order the best match for their needs as well as budget. 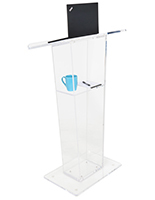 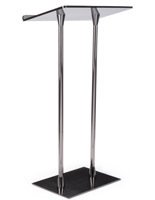 From full size lecterns with removable branded graphics to portable tabletop stands to elegant modern multifunction fixtures for ministry, school, or corporate speaking, our wide selection of quick ship stands can meet the need of any business in any industry.